Michael joined the Cathedral School at the age of 13 after attending Dulwich Preparatory School, London. At that time Dulwich was the main feeder school for boarders entering HCS and all students were placed in School House. Before Dulwich Prep., Michael was a pupil at Courshorne School, Cranbrook, Kent where he was still known as M J Wilkins. 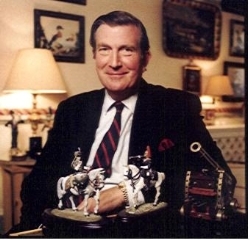 On leaving HCS in 1959 MJP won a scholarship to The Royal Military Academy, Sandhurst. After graduating as an Officer he joined The Queen's Own Hussars ( now called The Queen's Royal Hussars ) and rose to the rank of Major. Not only did he master his skills as a leader of troops on exercises but, more especially as a horseman on ceremonial duties. It was this experience which led Michael to develop his technique as a producer of national events of major importance. Since leaving the Army in 1971 he has been responsible for well over 70 National events. MJP was Producer of The Royal Tournament for 27 years and has organised many military events overseas. Michael masterminded then directed the Queen's Silver Jubilee celebrations in 1977. On the eve of the marriage in St Paul's Cathedral of HRH Prince Charles to Lady Diana Spencer in July 1981, he designed and produced a display called " The Royal Fireworks " in Hyde Park representing a re-creation of the Firework Palace of 1749. 180 members of the Royal Family plus Heads of State from around the world attended this event, including over 800,000 members of the public. This became the largest crowd ever gathered in one place in Great Britain. It is estimated that a further 200 million viewers watched the display on television. In 1992 the Queen's 40th Anniversary was celebrated with what Michael dubbed " The Great Event ". This was a retrospective look back over the past 40 years, when over 3000 people made up the cast of a show highlighting major events and achievements during Her Majestys' reign. It included numerous stars of stage, screen, TV and sport. Sir Michael produced The Royal Military Tattoo in 2000 on Horse Guards Parade as part of the National Millennium Celebrations. He had previously run many more public events of importance such as the Edinburgh Tattoo, but was also responsible for producing shows in Europe, as well as being asked to present displays in Gibraltar, Oman, the USA & Canada and as far afield as Hong Kong. MJP also continued to organise many royal pageants, processions and anniversaries, including of course the formal birthday party celebrations for Her Majesty, The Late Queen Elizabeth, The Queen Mother right up until her 100th birthday in 2000. OH's will recall that this event featured as a regular annual event in the London calendar every August until her sad demise in Feb 2002. Perhaps the most significant event organised by MJP, which will be remembered by many OH's, was the celebration of HM The Queens' Golden Jubilee in 2002. Michael produced a ceremony called " All The Queen's Horses " at Windsor, being a national equestrian tribute to Her Majesty. It included 1000 horses, 1800 participants plus an appearance of The Golden State Coach, rarely seen in public except on special occasions such as State Visits by overseas dignitaries. MJP also produced The London Golden Jubilee Weekend Festival between 1st and 4th June of that year, which included the lighting of the National Beacon by The Queen, followed by simultaneous beacon lighting ceremonies up and down the country. That same evening a ' Son et Lumiére ' party was held at Buckingham Palace, including Michaels' idea of an electronic lighting display cleverly beamed onto the fascade of Buckingham Palace throughout the night. Earlier in the day, following the attendance by Her Majesty at a Thanksgiving Service in St Paul's Cathedral, then a banquet, Michael had organised and produced a massive Festival Parade down The Mall. The Queen, accompanied by other members of the Royal Family were able to enjoy the pageant from a specially erected dias on The Queen Victoria Memorial roundabout. Over 20,000 participants took part in this parade, which featured various landmark events and achievements throughout each of the five decades of The Queens' reign. MJP wanted the youth of the country to make up the nucleus of entrants for each era being commemorated, thus providing an educating theme for youngsters to remember. The parade ended with a traditional flypast of the latest modern aircraft, including the now de-commissioned Concorde flanked by The Red Arrows. Michael Parker has been made a Knight of The Order of St John, a Military Member of the Order of The British Empire (MBE), a Commander of the British Empire (CBE) and a Knight Commander of The Royal Victorian Order (KCVO) He has also been awarded The Grand Officer of The Order of Al-Istiqlal ( Jordan ) for services to The Kingdom. His memoirs were published in 2013 entitled "Its all gone terribly wrong."